Judo Formal Techniques is "The most detailed explanation of Judo that has ever been published" (The Japan Times). 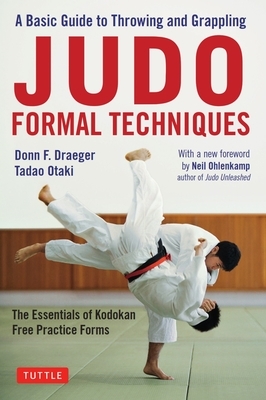 A comprehensive training manual to the basic "free practice" forms of Kodokan Judo (the Randori no Kata), the book provides essential instruction in the throwing and grappling kata (Nage no Kata and Katame no Kata) that every Judo practitioner needs to master. The authors are two of the world's top instructors--Donn F. Draeger and Tadao Otaki. Both were instructors at the Kodokan Judo Institute in Tokyo--the headquarters of international Judo, which was founded by the creator of the martial art, Jigoro Kano. Draeger, considered by many to be the first non-Japanese Budo master, was an authority on Asian martial culture who held high ranks and teaching licenses in several martial arts. He was a prolific writer and was the first non-Japanese Judo instructor at the Kodokan. Otaki was not only a successful Judo instructor but also a university professor who was widely praised for his research on the role of Judo in education. Draeger and Otaki based their text on Jigoro Kano's published and unpublished personal writings. Recapturing the original spirit and intent of the essential Judo kata, they are presented in the standard Kodokan versions as refined by generations of practitioners. Richly illustrated with over 1,000 photos and drawings, Judo Formal Techniques offers complete step-by-step instructions for the roles of both training partners. In addition to the core techniques of throwing and grappling, it explains the important transitional movements as well as grips, stances, and postures. First introduced as an Olympic sport at the 1964 Tokyo Olympics, Judo is returning to its home city on the world stage at the 2020 Olympics. Practiced by more than 20 million people worldwide, Judo is only expected to continue growing in popularity. A new foreword by Judo instructor Neil Ohlenkamp sheds light on the book's lasting importance as the classic "Kata bible" for Judo students and instructors alike and an indispensable resource for all martial arts practitioners. Donn F. Draeger (1922-1982) is one of the world's leading authorities on the Asian martial arts and was a highly regarded figure in Japan. Licensed in Japan as a teacher of numerous martial arts, he wrote prolifically on the subject. His many publications include The Weapons and Fighting Arts of Indonesia, Shaolin Lohan Kung-fu and the six-volume Practical Karate series. Tadao Otaki (1908-1998) was Professor of Physical Education at Tokyo Education University. He was recognized for his long experience as a Judo instructor to everyone from beginners to Olympic champions and his contributions to its teaching methods. Neil Ohlenkamp has been a Judo instructor for over 45 years. He is a 7th degree black belt and was head coach of the U.S. Judo squad at two Paralympic Games. He is a member of the Kodokan Judo Institute and head instructor at the Encino (CA) Judo Club. He is the author of Judo Unleashed: Essential Throwing & Grappling Techniques for Intermediate to Advanced Martial Artists.